Definition at line 52 of file CrossWindows.h. Definition at line 208 of file CrossWindows.cpp. Definition at line 258 of file CrossWindows.cpp. 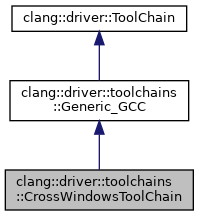 References AddCXXStdlibLibArgs(), clang::driver::ToolChain::addSystemInclude(), clang::driver::ToolChain::CST_Libcxx, clang::driver::ToolChain::GetCXXStdlibType(), clang::driver::ToolChain::getDriver(), and clang::driver::Driver::SysRoot. Definition at line 232 of file CrossWindows.cpp. References AddClangCXXStdlibIncludeArgs(), clang::driver::ToolChain::addExternCSystemInclude(), clang::driver::ToolChain::addSystemInclude(), clang::driver::ToolChain::getDriver(), P, clang::driver::Driver::ResourceDir, and clang::driver::Driver::SysRoot. Definition at line 271 of file CrossWindows.cpp. Definition at line 289 of file CrossWindows.cpp. Definition at line 285 of file CrossWindows.cpp. Definition at line 63 of file CrossWindows.h. Definition at line 277 of file CrossWindows.cpp. Definition at line 57 of file CrossWindows.h. Definition at line 219 of file CrossWindows.cpp. Definition at line 227 of file CrossWindows.cpp. Definition at line 223 of file CrossWindows.cpp. Definition at line 213 of file CrossWindows.cpp.